Fiorentina are on the verge of signing midfielder Alberto Aquilani from Liverpool, The People understands. The English newspaper claims the Serie A side have already agreed a £7 million fee with the Reds and all that’s left is for them to agree personal terms with the player. New Liverpool boss Brendan Rodgers admitted earlier this week that he was prepared to give the Italian a chance to impress, but it appears he has now changed his mind. The highly rated technician is hoping to lure Swansea’s Joe Allen to Anfield, and, therefore, wants to get rid of Alberto Aquilani. The 28-year-old, who was pretty impressive in pre-season games, will reportedly jump at the opportunity to return to Serie A following several difficult years in English Premier League. The Italian international spent last season on loan at Milan, but the Rossoneri opted against making the deal permanent at the end of the season. Former France international Zinedine Zidane is set to take up coaching role at Santiago Bernabeu, Real Madrid have revealed. The 40-year-old, who ended up his playing career at Real Madrid, has been working as a sporting director with los Blancos since last year, but he is now set to be given a new position. The Frenchman has decided to pursue a coaching career and the Spanish giants have announced Zidane will be employed in club’s youth academy while he studies for a diploma in sports management. “Zinedine Zidane will shortly begin training to be a coach while at the same time coaching Real Madrid’s youth academy,” the statement on club’s official website read. The Frenchman has enjoyed a lot of success during five years at Santiago Bernabeu and scored a total of 37 goals in 155 La Liga games for los Merengues. Zidane recently expressed his interest in coaching France national team and he was tipped as one of contenders to replace Laurent Blanc at the helm of les Bleus. Sevilla have reached an agreement with Palmeiras over the signing of full-back Alexandro Mendonca Dos Santos, the Spanish club announced on their official website. Los Rojiblancos have been very active in the summer transfer window, having already signed no less than five new players, and now they are on the verge of completing the sixth signing of the summer. The La Liga side have announced on their official website that they have reached an agreement with Palmeiras to sign Brazilian right-back Cicinho. The player is scheduled to have a medical in Seville later today and is set to sign a four-year deal with los Rojiblancos. The 25-year-old is an attacking full-back who has spent last two seasons at Palmeiras following a move from Santo Andre. Cicinho has made 71 league appearances for the Brazilian giants and scored 2 goals in the process. For more news about football transfers and rumours, visit our Transfer News section. To view all football transfers for 2012/13 season, visit our Soccer Transfers section. French midfielder Yohan Cabaye has called international teammate Mathieu Debuchy to join him at St James Park. The Lille full-back has expressed his desire to leave les Dogues this summer and he has been heavily linked with a move to Newcastle. The highly rated defender is reportedly interested in joining the Magpies, where he would be reunited with former Lille captain Yohan Cabaye. The player, who largely impressed since making a €5 million move to St James Park, hopes Newcastle can win the race for Debuchy. “Mathieu has made a very difficult to decision to leave Lille but he has made the decision,” Cabaye told The Journal. “Now I hope Newcastle push for Mathieu and I want them to do the deal. I spoke with him two days ago and he told me he wants to come. I hope Derek (Llambias) and Mike Ashley will do the business now. Debuchy is an attack-minded defender and he would form an excellent full-back partnership with Davide Santon at St James Park. Catalan daily Sport understands that Barcelona have joined the race to sign midfielder Joao Moutinho from Porto. The highly rated midfielder has been linked with Manchester United and Tottenham following some scintillating showings at the Euro 2012, but it appears Barcelona have moved to the front of the queue. Catalan newspaper Sport claims that the La Liga giants want to sign the 25-year-old as a replacement for Seydou Keita. The Catalans initially tried to sign Javi Martinez from Athletic Bilbao but decided to turn their attention to Moutinho after being informed the Spaniard would cost €40 million. The Portuguese international caught the attention of Barcelona scouts during his time at Sporting Lisbon and the Camp Nou outfit have now reignited their interest in the experienced midfielder. According to the source, Moutinho can be purchased for around €18 million, which is well within Barcelona’s price range, just like the player’s salary of €1.5 million per campaign. The Portuguese footballer, who scored 3 goals in 29 league games for Porto last season, is a highly skilled player and he would fit perfectly into Barca’s style of play. Wolverhampton Wanderers have won the race for Tongo Doumbia after agreeing to a season-long loan for the midfielder, Sky Sports reports. Wolves beat bitter Midlands rivals West Bromwich Albion to Doumbia, making Stale Solbakken’s third summer signing that much sweeter. “I am delighted we have managed to sign Tongo who will bring some more quality to the squad,” Solbakken told Wolves’ official website. Wolves were relegated from the Premier League last season, and will play their league football in the English Championship next season as a result. Arsenal look in pole position to sign Real Madrid's highly rated striker Joselu. The 22-year-old has been top scorer in recent season for the Real Madrid B team but has failed to make an impression on the first team. Having only made 2 appearances for the first team and Madrid's strength up front reports suggest that he is set for a move this summer. Arsenal have been linked with the striker who has claimed he would love to play in the Premier league. Whilst Robin Van Persie's future remains a mystery, Wenger is looking to bolster his squad and could make a move for Joselu this summer. La Liga champions Real Madrid are seeking €8-€10million (£6.2m-£8.2m) for the services of 22-year-old forward Joselu, according to Sky Sports. TSG 1899 Hoffenheim are potential suitors for the young striker, but they are not willing to meet Los Blancos’ transfer fee demands. “A transfer fee of €8-€10m for a third-tier player is absolutely inexplicable,” Hoffenheim boss Markus Babbel told Deutsche Presseagentur. Joselu is signed through June 2014, but appears likely to leave the Estadio Santiago Bernabéu in favour of first-team football. At the moment, he is behind the likes of Karim Benzema and Gonzalo Higuaín in Jose Mourinho’s pecking order, and rightfully so. Will Joselu move to the Rhein-Neckar-Arena this summer? Turkish Super League giants Galatasaray S.K. have rubbished reports linking Manchester United striker Dimitar Berbatov with a £5 million move to the Türk Telekom Arena, the Daily Mail understands. “There have been some reports in the media that Dimitar Berbatov will be transferred to our club,” read the club’s official statement. After finishing as the joint top goal scorer in the English Premier League in 2010-11, Berbatov made just five league starts for the Red Devils last term. To state the obvious, the 31-year-old wantaway forward was, as they say, ‘out-of-favour’. 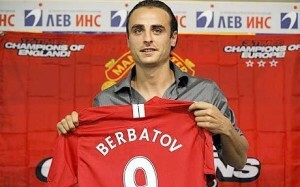 To this day, Berbatov is Manchester United’s record signing after joining the Red Devils for £30.75 million from Tottenham Hotspur in September 2008. The Bulgarian netted 1o goals and two assists in 24 appearances (14 starts) in all competitions for the Reds in 2011-12. Premier League newcomers West Ham United and French super club Paris Saint-Germain have also been linked with Berbatov in recent weeks. Now then, will Manchester United cut ties with their record signing this summer? It’s been acknowledged this summer that the Liverpool squad needs a major reshape. At the moment though the transfer rumours regarding Liverpool seem to be all about players exiting the club, rather than arriving. This summer Liverpool have already parted company with attackers Dirk Kuyt and Maxi Rodriguez. The Reds also let perennially injured Fabio Aurelio leave the club. Rodriguez and Kuyt were more than useful players and there is no sign of them being replaced. Manchester City have had two bids turned down for the Danish centre-back, according to Sky Sports reports. Those bids were believed to be £13million and £16million. The Citizens are now considering whether to come back in with a bigger bid. Spanish giants Barcelona are also interested in signing the defender. Agger seems to be interested in a move away from the Reds, as he could win silverware and up his wage in Manchester and the Catalan capital. Agger’s central defensive partner from last season is also believed to be attracting interest from Manchester City. Obviously City won’t sign both of the defenders, but rumours persist that the Champions are interesting in signing the Slovakian defender. Should a move for Agger fail, then City could revive their interest in the big centre-back. The 27 year-old’s agent revealed earlier this month that other clubs are interested in his services and there are no guarantees that he will stay at Anfield this summer. Boss Brendan Rodgers has stated that he will fight to keep the defender on Merseyside. Andy Carroll is regarded as one of the most expensive flops in the history of British football. He arrived at Liverpool for £35million from Newcastle in January 2011 and has struggled to find his best form. However, towards the end of last season he started to look like a threat to defences. 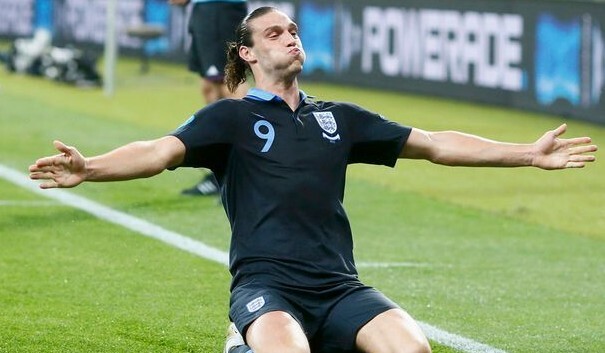 Carroll is just 23 years-old and still has time to develop into a really good Premier League striker. However, at the moment it doesn’t look like that will be at Anfield. Reds boss Rodgers has already stated that Carroll doesn’t fit into the style of play, but he still thinks Carroll’s a good player. West Ham have been heavily linked with a move for the striker. The Hammers were reported to have offered to take the striker on-loan for the season, with a view to a permanent transfer next summer. However, the England international is believed to only be interested in a move to a club that has European football next season. His hometown Newcastle United have also shown an interest and they could offer him European football. He thrived at Newcastle and a loan spell back in the North East could be just the confidence lift he needs to lift his career. It seems that Liverpool would prefer a permanent move, as they need the funds to strengthen their squad. Liverpool boss Brendan Rodgers needs to sell before he can buy. Swansea midfielder Joe Allen is at the top of his wish list. The fee that the Swans are likely to demand is £15million and that’s a lot of money for a player with just one season of Premier League football under his belt, albeit a good one. Fulham attacker Clint Dempsey has also been heavily linked with the Reds. The American international has been linked with a £10million move to the Reds. He could prove a very good signing, but Fulham are reluctant to let him leave, despite the fact that he is now in the last year of his contract. If Liverpool have to sell to buy then they really are in trouble for next season. The players that are being linked with a move away are not the players that disappointed last season, except for Carroll at times. Liverpool need to sell their dead wood, not their best players. Unfortunately it seems nobody is interested in signing their underachievers, just their stars. If Liverpool sell the likes of Agger or Skrtel this summer the Reds will fall even further behind the top sides next season and they really can’t afford to. Are Liverpool now a selling club? Recent reports suggest that Tottenham will secure the services of Emmanuel Adebayor within the next two days. The Togo striker spent last season on loan with Spurs and is close to making a permanent move from Manchester City for around £5million. Talks regarding the move appeared to have hit some difficulty when Tottenham couldn’t agree on Adebayor’s demands of £170,000-a-week but it is now believed that the North Londoners will pay the former Arsenal man a £5m signing-on fee with City to subsidise the striker’s wages. Man City secure a win in their final pre-season Far East game as they beat Malaysia XI 3-1. The Philadelphia Union came from behind to clinch a dramatic 2-1 victory over the New England Revolution in MLS action on Sunday. Young forward Jack McInerney headed the winner in the 90th minute after Union star Freddy Adu had cancelled out Frenchman Sene Saer’s opening goal. The win was Philadelphia’s fourth in five matches, while the Revolution slumped to their third loss in four outings. Sene opened the scoring with a cracking shot from outside the box that flew past Philadelphia goalkeeper Zac MacMath in the 12th minute. Kelyn Rowe almost doubled New England’s advantage soon after with a shot that beat MacMath but sailed just wide of the target. The match took a controversial twist in the second half as Union defender Carlos Valdez appeared to handle the ball in the penalty area in his attempt to block a Sene shot. And the Union were awarded a penalty less than 10 minutes later as McInerney was brought down on the edge of the box, with Adu converting the spot-kick. Philadelphia upped the ante in the dying stages and were rewarded through McInerney, who knocked in a Sheanon Williams cross to the delight of the home fans at PPL Park. Barcelona could make a shock move for Manchester City centre-back Kolo Toure, that according to the Daily Mirror. Toure has found game time hard to come by since being available to play after his six month professional ban from the game and he may now need to move on to increase his chances of first-team football. The La Liga side seem keen on the defender as they are looking to strengthen their options at the back after both Carles Puyol and Gerard Pique had their injury problems last season. New boss at the Nou Camp Tito Vilanova is set to want a squad player that can be used as a utility man, something Toure is well suited too. It may be a chance for the Ivory Coast international to prove that he can still play at the top level and at 31-years-old, is certainly a massive decision for him to make. His brother Yaya played for the Spanish side before joining City so he is sure to be told what to expect should he join Barcelona. Vilanova is not looking to splash out the cash on the defender though and if he cannot get him for a good price, will look elsewhere. Talk Sport are today reporting that Real Madrid are mulling over making a bid for Benfica star man Axel Witsel. It is being suggested that it will take around £31 million to lure the 23-year-old away from the Portuguese side and Real are keen to come up with the cash to secure his services. Witsel had a superb campaign for Benfica last season after joining from Belgium side Standard Liege just a year ago. The La Liga team are now looking to make a move for the midfielder and are prepared to pay a massive amount for the Belgian international. Real are of course looking to retain their league title this campaign and make a challenge for the Champions League and should they complete this signing and that of Luka Modric from Tottenham, will certainly show their intentions for the year. This deal could mean that Manchester United may have to look elsewhere in the transfer window. Sir Alex Ferguson had been reportedly keeping tabs of Witsel but should Jose Mourinho come in for him with this large amount of money, United will have to lose out on their long-term target. Ferguson is looking to find a replacement for Darren Fletcher, who doesn’t look like returning to action anytime soon after his abdominal injury. Arsenal manager Arsene Wenger admits that Lukas Podolski and Olivier Giroud will not be ready for the start of the Premier League campaign. Arsenal’s preparation for the new season has not gone as planned, with the club completing a tour of Asia with a 2-2 draw against Hong Kong champions Kitchee on Sunday, but a friendly in Nigeria planned for the weekend was cancelled, leaving just one match left against Cologne. Wenger had last week revealed Jack Wilshere would not return until October, and explained that many of his players may not be ready to start the new season, having stayed home during the tour. “The players who were out here will have had enough games but some players will have only one game,” he said. “Lukas Podolski and Olivier Giroud may take longer than expected. I cannot play them in pre-season, so I will ease them in the Premier League. “Bacary Sagna will be short for the start of the season and Tomas Rosicky will not be back until September, in my opinion. Meanwhile, Wenger said he would hold talks with mercurial winger Andrey Arshavin to decide if the Russian has any future at the north London club. The 31-year-old forward spent the second half of last season on-loan at former club Zenit St Petersburg, having been heavily criticised by a section of Gunners supporters. Additionally, the Russia captain had been expected to leave the club this summer, to create funds for further arrivals after the signings of Podolski and Giroud. Nevertheless, Wenger has not ruled out keeping Arshavin, a 15-million-pound signing in January 2009, at the club, despite him not being included on the club’s tour of the Far East. “Arshavin, it depends. We have to sit together and have talks. He could still have a future at the club,” Wenger said. However, other bit-part players have been deemed surplus to requirements, most notably French defender Sebastien Squillaci and South Korean forward Chu-Young Park, both of whom have failed to impress since arriving from Sevilla and Monaco respectively, while Danish international striker Nicklas Bendtner, who spent last season on loan at Sunderland, is also available for transfer. “Bendtner, Squillaci and Park will be on their way to go somewhere,” added Wenger. Nigel de Jong has rubbished reports he could be on his way out at Manchester City, insisting he is happy with the Premier League champions. The Dutch midfielder has just one year remaining on his contract and with City boss Roberto Mancini often using him as a substitute, rumours have linked the 27-year-old with a move away from the club. “I don’t want to talk about that at the moment, it’s not in my mind. I’m playing football and I’m happy here,” de Jong told the Manchester Evening News. After winning last season’s league title in dramatic circumstances on the final day, City have now set their sights on the Champions League. And while de Jong says the club are focused on winning every trophy they can, he says success in Europe’s premier club competition is integral to their attempt of continued progression. “Of course, that’s what we all want because that’s the way to go forward,” he said. “We set ourselves the goal of taking it step by step. We won the FA Cup last year, then the Premier League last season, so the next thing is the Champions League. Striker Jerry Bengtson dumped Spain out of the Olympics as Honduras pulled off a major shock at St James’ Park. The 25-year-old’s seventh-minute header, his third goal in two games, ensured that the Spaniards, whose senior team are reigning World and European champions, will go home early following an opening defeat by Group D leaders Japan. In an ill-tempered encounter, Iker Muniain hit the post and substitute Rodrigo the bar amid a second-half Spanish onslaught, but the Central American side battled heroically to keep Luis Milla’s star-studded side at bay. Ten-man Senegal blew Group A wide open with a shock win over highly-fancied Uruguay at Wembley. Impressive teenager Moussa Konate scored twice, either side of Abdoulaye Ba’s first-half dismissal. And in a match littered with fouls – and five more yellow cards – Senegal kept the World Cup semi-finalists at arms’ length, with Luis Suarez coming closest when he headed into the side netting. Outsiders to qualify before the competition started, Senegal know a victory against United Arab Emirates in Coventry on Wednesday will send them through, leaving Great Britain and Uruguay to scrap it out for the additional quarter-final berth. Tottenham playmaker Giovani dos Santos was Mexico’s hero with both goals in their Olympic Games Group B clash with Gabon at the City of Coventry Stadium. Giovani, who struggled to earn a place under Harry Redknapp at White Hart Lane, was introduced as a second-half substitute and broke the deadlock after 63 minutes. He then scored from the penalty spot in injury-time after Gabon defender Henri Ndong was sent off for a professional foul. Former Barcelona player Giovani, signed for Tottenham by Juande Ramos four years ago, secured Mexico their first win of the tournament and put them on course for the quarter-finals. Zlatan Ibrahimovic scored his first goal for French side PSG against D.C. United during the World Football Challenge 2012 at RFK Stadium on July 28, 2012 in Washington, DC. The 30 year old Swedish international striker scored a beautiful goal early in the game. 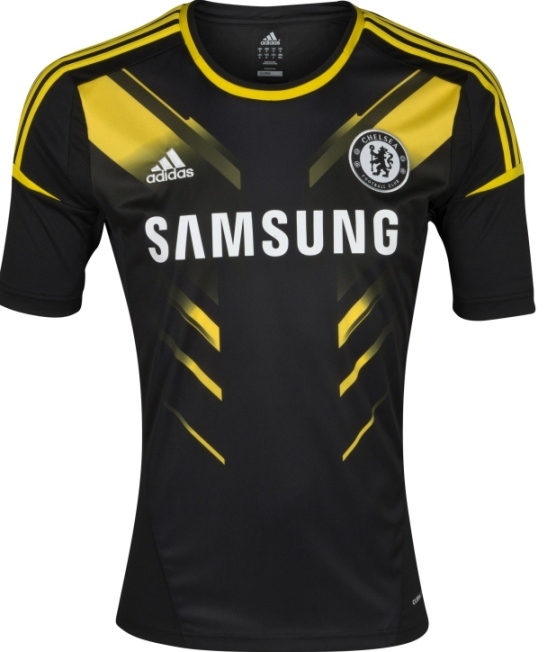 Here is a look at Chelsea FC’s new 2012/13 season third kit, a black and yellow top from Adidas for the reigning European champions, who have signed the likes of Marko Marin and Eden Hazard this summer as they aim to again challenge for the title. Neymar puts in a virtuoso performance, including one superb free kick, as he sends Brazil into the quarterfinals of the 2012 Olympics with a 3-1 comeback win over Belarus. Lionel Messi scores a first half hat trick as Barcelona crush Raja Casablanca 8-0 in a pre-season friendly. After a 3-2 loss to the All Stars, Chelsea suffer defeat again in pre-season as Urby Emanuelson helps Milan beat Roberto di Matteo’s side 1-0 in Miami. Goals from Demba Ba and Ryan Taylor help Newcastle beat Sporting Braga 2-1 in Portugal. Goals from Alessandro Matri and Milos Krasic give Juventus a 2-0 win over Hertha Berlin. Kris Commons scores a wonder goal but Celtic are denied a win over Inter as Rodrigo Palacio scores a late equaliser for the Italians. Newcastle and Olympiakos play out a 1-1 draw in pre-season with the penalty shootout also ending on level terms. Enzo Perez scores a brace as Benfica beat Real Madrid 5-2 in a pre-season friendly. First half goals from Pablo Zabaleta and Yaya Toure give Manchester City a 2-0 win over Arsenal in a pre-season friendly. Arsenal starting lineup vs Man City friendly:-Fabianski, Jenkinson, Bartley, Vermaelen, Gibbs, Diaby, Arteta, Song, Andre Santos, Walcott, Gervinho. Olympics Football favourites Brazil U23 survive a second half Egyptian comeback as they triumph 3-2 at the Millenium Stadium. Moussa Konate scores a late equaliser as Team GB draw 1-1 with Senegal U23 at the Olympics Football tournament. Reports are out claiming that Inter Milan are interested in Everton defender Johnny Heitinga. The Daily Mail revealed that the Premier League club would be willing to sell as he is one of the club’s better earners and will be 29 in November but the versatile defender is ready to reject the offers and stay at Goodison Park. It may change if Inter came back with a formal offer rather than mooted interest but as it stands Heitinga will be lining up for Everton in August. Chelsea boss Roberto di Matteo has revealed that Fernando Torres will start against AC Milan in Miami today. It will be Torres’ first game for Chelsea since playing in the Champions League final. “Fernando is going to play in his centre-forward role, it is just a question of how much time he can play on the pitch,” Di Matteo said. The 23-year-old England international has been linked with interest from a number of clubs including AC Milan, Newcastle, Fulham and Aston Villa but most of the sides which have shown some interest are keen on an initial season-long loan deal. Andy Carroll appears to be falling down the pecking order at Anfield and chairman Tom Werner said yesterday he will leave any decision on the striker’s future to manager Brendan Rodgers. Hammers boss Sam Allardyce has been after the big Geordie ever since it emerged he would not play a starring role in Brendan Rodgers’ plans at Liverpool. Hammers’ co-chairman David Sullivan and David Gold are prepared to break the club’s record transfer fee – which currently stands at £7million – to bring Carroll to Upton Park. Carroll worked with West Ham boss Sam Allardyce when the pair were at Newcastle. However, the Hammers may find some resistance from Carroll himself. The former Newcastle striker is keen to move back to his old club should he find himself out of the picture at Anfield but Liverpool will want around a bid of around £20million before they sanction a deal. Liverpool manager Brendan Rodgers is believed to be showing interest in Wolves goalkeeper Dorus De Vries. The 31-year old Dutchman joined Wolves as a free agent last summer after departing Swansea City where he was number one under Rodgers who is suggested to be keen to bring him to Anfield. Sky Sports is of the belief that Rodgers could make a move to bring in De Vries as Pepe Reina’s back-up with Alexander Doni and Brad Jones likely to leave this summer. Belgian footballer Vincent Kompany is set to continue at the Manchester City after he signs a new 34 million pound contract with Etihad. According to The Sun, the contract is believed to be for five years and worth about 130,000-pounds-a-week and is ready to be signed in the next few days. 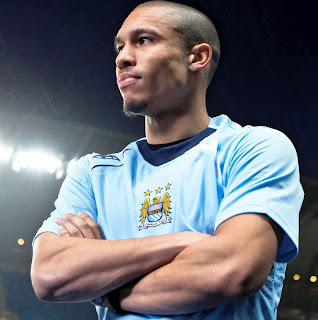 Kompany, 26, verbally agreed to City in the deal, as player prepare to jet out for a pre-season tour of the Far East. He will now be at the Etihad until well into his thirties, which is being seen as a big boost for everyone at the club. The former Hamburg defender had impressed with his leadership skills on and off the pitch since taking the armband from the controversial Carlos Tevez last summer. A major diplomatic incident marred the first day of competition at the London Olympics when the North Korea women’s football team walked off after the South Korea flag was mistakenly displayed before their match against Colombia. The error occurred at Glasgow’s Hampden Park which was hosting one of the day’s six matches kicking off the women’s tournament and led to a delay of more than an hour before the game eventually started with the Koreans winning 2-0. The pre-match drama in Scotland overshadowed what followed on the pitch as sporting action began around Britain two days before the official opening ceremony of the Games in London on Friday. The trouble began when the South Korea flag was shown on a giant screen before the kick-off of the Group G match at Hampden, one of five venues hosting games outside London, and Olympic organisers had to issue an apology. Eddie Johnson scores a stoppage time winner as the MLS All-Stars stun European champions Chelsea 3-2 at PPL Park. Liverpool suffer their first pre-season friendly loss as Michael Bradley helps Roma beat the Reds 2-1 at Fenway Park. Liverpool starting lineup v AS Roma 2012:- Gulacsi, McLaughlin, Skrtel, Carragher, J.Enrique, Spearing, Shelvey, Aquilani, Cole, Eccleston, Sterling. Given the sheer number of mobile apps for sports betting that are now available – with pretty much all of the major sports gaming companies producing them – when it comes to making a choice about which one to use, most people will come to a decision based on what they consider to be the most important single factor for them. For some people this may be the size of the bonuses – like the new player free bet – while for others it may be the overall quality and ease-of-use offered by the app. When it comes to offers such as the free bet bonus for new customers, most of the mobile sports betting apps provided by the major companies pitch this at about the same level. There are minor variations, with William Hill offering £25 with their app, while bwin offers £30, but they are all at roughly the same level. However, there are a couple of sports betting apps that offer substantially higher free bet bonuses; namely the Bet365 app and Sportingbet.com one. The former of these offers a free bet bonus of £200 for new players, while the latter offers £100 – but overall the Sportingbet.com app is probably the superior one, due to less bugs and glitches and the fact that it is available across all platforms. However, when it comes to the overall design of sports betting apps, it is the Bwin one which has developed the best reputation in this area. It offers a degree of simplicity which makes it by far the easiest such app for inexperienced players to use and, again, the company has now made it available across all platforms. Reports have emerged that Nigel de Jong is not a transfer target for Bayern Munich. The Dutch international has been linked with a possible summer move to the German giants but Rumenigge insists the club is not interested in his services. Bayern chairman Karl-Heinz Rumenigge said : “We know that de Jong’s agent offers him anywhere,”. Reports are out claiming that Arsenal boss Arsene Wenger insists he doesn’t want to see Robin van Persie sold. Manchester City, Manchester United and Juventus are hoping to sign the Dutch ace. Manchester United have been told to up their bid for River Plate sensation Ezequiel Cirigliano. United are understood to have tabled a £5 million offer for the 20 year-old midfielder, but River won’t let him leave for such a sum. Ole says United have been informed to pay Cirigliano’s buyout clause – £12.5 million – if they want to sign the youngster. River need to sell to balance the books, but won’t be taken for mugs by the Premier League giants. It has been reported that Borussia Dortmund are softening their stand over Robert Lewandowski’s asking price. Manchester United, Chelsea, Manchester City and Tottenham have all made enquiries after the Pole since the end of last season. After previously quoting a fee of near £30 million, La Gazzetta del Mezzogiorno says Juventus have been told Lewandowski can leave for around £17 million. If it came down to an auction, Lewandowski would prefer the Premier League over Serie A. Reports are out claiming that Newcastle United are willing to cough up £15 million for Marseille striker Loic Remy. The Guardian reported that although the 25-year-old striker is valued at around £15m, Rémy is entering the final year of his contract at Marseille and Newcastle believe there is scope for negotiation. They could face competition from Arsenal and Tottenham for a forward who scored 20 goals in 42 appearances last season. Angel di Maria nets twice as Real Madrid crush Real Oviedo 5-1 in a pre-season friendly. Real Madrid starting lineup vs Real Oviedo 2012:- Adan, Granero, Morata, Casado, Mateos, Alex, Ivan, Mosquera, Denis, Juanfran, Lucas. Urby Emanuelson scores the only goal of the game as Milan beat Schalke 1-0 in a pre-season friendly. Gareth Bale scores as Tottenham Hotspur draw 1-1 with Los Angeles Galaxy in their pre-season tour. Los Angeles Galaxy starting lineup vs Spurs 2012:- Perk, De La Garza, Gonzalez, Lopes, Gaul, Franklin, Sarvas, Stephens, Jimenez, Keane, Villareal. Spurs starting lineup v Galaxy 2012:- Cudicini, Walker, Kaboul, Vertonghen, Bassong, Livermore, Sigurdsson, Townsend, van der Vaart, Bale, Defoe. Shinji Kagawa netted his first goal for Manchester United as a dominant display gave the Red Devils victory against a Shanghai Shenhua side minus former Premier League stars Didier Drogba and Nicolas Anelka. Kagawa scored with just over 20 minutes remaining following great work by Bebe down the right and although United enjoyed enough chances to rack up a cricket score, the summer signing’s goal proved decisive. Japanese star Shinji Kagawa scores the only goal of the game in the second half as Manchester United beat Chinese outfit Shanghai Shenhua 1-0 in a pre-season friendly. - Participation in (Under-19) SAFF CUP International Women Football Championship 2010 in Dhaka, Bangladesh. - Participations in Sub Junior National Football Championships. - Participations in Junior National (4 times), Senior National Football Championships (2 times). - Participation in 34th National Games, Jharkhand & All India Inter Varsity Women Football Championship. "Six members in a family and only one source of income i.e. pension"
The above are not the list of the various women football championships which undergoes in the country, infact these are the rare achievement of 20 years old promising footballer of the country, Naagi Maardi. Every sportsperson has a dream to represent the country in the International level but Nagi wants to hang her boots up. She wants to quit the game and complete her graduation. Playing as a stopper back in the National team, Nagi started her football journey during her school days under school Football Coach Chandra Mohan. Presently she is under the coaching and guidance of the SAI Coach Sunil Kumar at Ranchi. Till today she has played in almost all the major tournaments throughout the country but is unable to find a job for herself which disheartens her to continue the game. This is her last year in SAI Ranchi and after this she sees her football career in the dark as till yet no Government or private organization has approached towards her. Even she has tried in some government sports quota jobs but nobody responded her. Presently she just enrolled herself in under graduation course and now wants to complete her graduation and get settled somewhere at the earliest as there is no possibility to get a job through sports quota. Her father Khetro Mohan Maardi, a retired Government servant from Tata Steel, said "the National players should get support from the government, then only the parents will allow their children to join sports". Now, Naagi wants to complete her graduation first as she doesn't have any help from the sports bodies too. Should Nagi quit the game ? Late goals from Thomas Eisfield and Chukwuemeka Aneke help Arsenal avoid embarrassment against a Malaysia All Stars team as they prevail 2-1. Bayern Munich score thrice in either half as they beat Beijing Guoan 6-0 in a pre-season friendly. Reports are out claiming that Tottenham have launched a bid for AS Roma striker Marco Borriello. The 30 year old Italian international striker is up for sale after spending last season on-loan at Juventus. Spurs will make a bid for Borriello this week after being blocked from talks for Atletico Madrid youngster Adrian. Below are the portraits of the players and coach of Team GB for the 2012 London Olympics. Check it out. How do you think Team GB will fare during the London Olympics? Leave a comment below and let us know what you think.